The store closed in 1992, but its employees still gather every year in December to remember their Frederick & Nelson family. There was a doorman to welcome you. An army of well-dressed, well-coiffed people to smooth every sale. There was a post office. A hair salon. A fashion show every Wednesday in the tea room. And a Jackie Kennedy look-a-like running the elevator. In these days of parking-lot rodeos and Amazon Prime, Frederick & Nelson sounds like a department-store dream not only for those who shopped there, but for those who made it hum. The store closed in 1992, but even before that, former employees started meeting for a pre-Christmas lunch on the first Thursday in December. 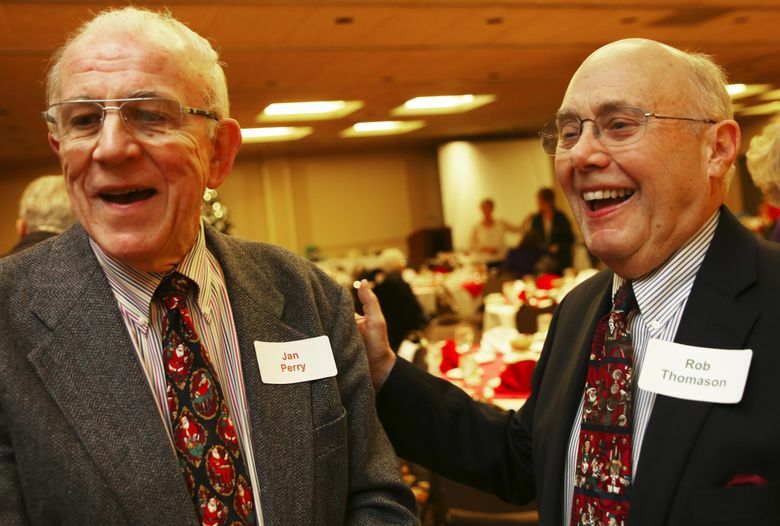 The other day, about 120 members of “The RFQ Club” (retired, fired, quit) gathered in a banquet room at the Best Western Executive Inn in Seattle to see each other, laugh and remember. “It was like working for a family,” said organizer Jan Perry, 79, a former buyer who left the store in 1981. The reunions started 30 years ago, when Perry made a reservation for 12 at The Cloud Room downtown. Twenty people showed up. For the first four years, the group was all male, until former female employees included themselves. Richard Mabie, 70, was hired right out of the Army to work in bedding and linens at the Aurora Village store in 1963. He was at the Pine Street flagship store until the bitter end, helping with whatever was needed. One Friday, they told him not to come back Monday. So he went up to human resources and retired, then headed home. The store suffered from ownership and management changes, competition and the late-’80s recession before closing in May 1992. Paula Ross, who bought toddler’s clothing, remembered how Nordstrom invited former Frederick & Nelson employees to preview the new store when it took over the Pine Street space in 1998. Hugh Mann, now 91, worked at the store from 1943 until the end, serving as vice president in charge of marketing and visual presentation. He said he designed the six-sided box for Frango mints, the signature chocolate truffles first created by Frederick & Nelson in 1918. “That’s the only thing that survived,” he said of the store’s legacy. Sylvia Pugh remembered working in the Christmas shop until late Christmas Eve, and returning the day after Christmas to find crowds of shoppers — and none of her scheduled cashiers. “Nobody showed up,” she said. Pugh is now a buyer in the gift shop at a retirement home. Her husband, Mel — whom she met at Frederick & Nelson — passed away earlier this year. They were married 42 years. Vicky Wolfe, 73, had just graduated from high school when she got a job as one of Santa’s helpers. She stayed on, eventually becoming an elevator girl because she fit into the clothing. The store paid for her to get her hair done every week in the salon. It made her look like Jackie Kennedy — which was good. “We were the first impression when people walked into the store,” she said, recalling a white wool sheath dress she especially loved. Any interesting stories from her up-and-down days? Wolfe’s husband, Al, 75, worked in the stockroom for a while and used to shoot rubber bands at her when she walked by. He went into management and then delivery, staying for 32 years. At one table, Barbara Bertsch, Ellen Carnwath and Becky Jones filled me in on the Frederick & Nelson rules and regulations. There were three golden words: Quality. Service. Integrity. Women could only wear dresses or skirts in shades of blue, brown, black or gray. Nothing sleeveless. Women’s hair could only be shoulder-length, and men’s couldn’t touch their collars. Pregnant women could work until they started showing. Sounds like Catholic school, I cracked. Nobody laughed. “I miss it terribly,” Carnwath said, a little dreamily. “Such a fabulous store,” Jones agreed. Bertsch remembered seeing merchandise come in from Europe, and feeling she was part of the fashion world. 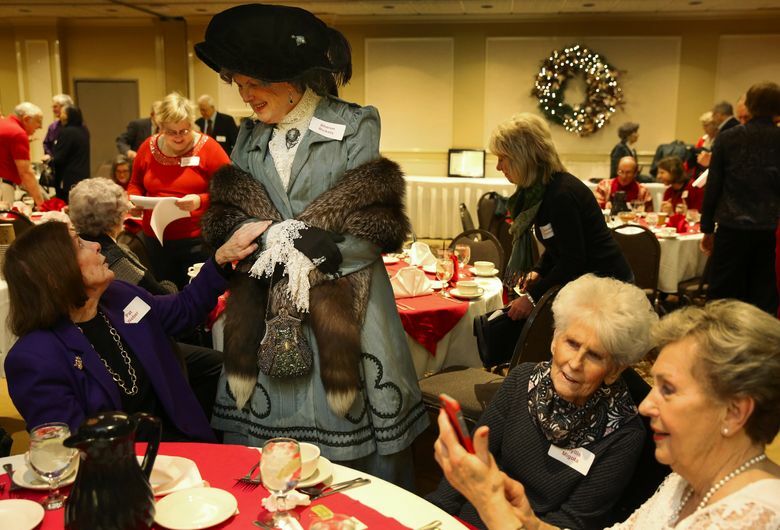 Sharon Ricketts, who worked in billing, arrived in period clothing, including a silver-fox stole that was left in the store’s fur storage department and later sold at auction, where she snapped it up for $7.54. “I still would rather be shopping at Frederick & Nelson,” she said. 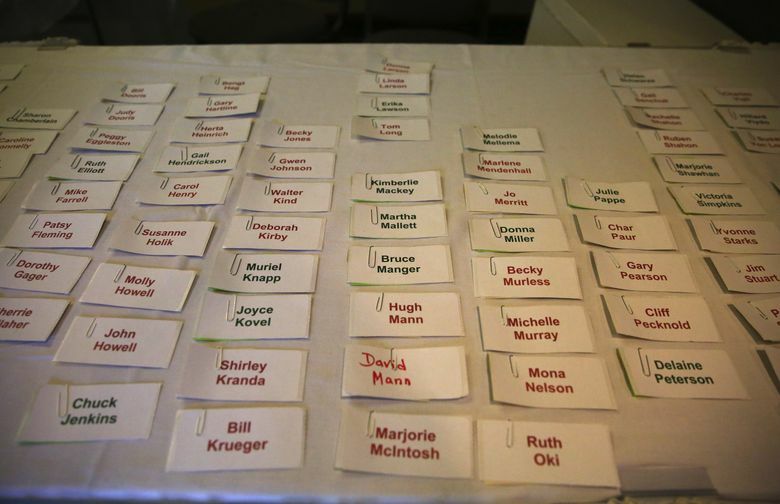 Perry, the organizer, understood completely. Working at Frederick’s made him a retail critic. “I bought them through Amazon,” he said with a sheepish look. “That’s what everybody does nowadays.